I am a little surprised that the Daimajin trilogy was a product of Daiei rather than Toho. The trilogy, all released in 1966, combine Japan's two great film exports: period samurai films, and giant monsters. Daimajin is not as well known as other giant monster films, perhaps because the films sit uncomfortably between those two genres. Since samurai films tend to be historical dramas, so the supernatural does not sit well with the usual audience. And Daimajin's rampage is only in the last fifteen minutes of the film, leaving the monster-film aficionado cold while the costume drama unfolds. Daimajin was sealed away by a local god. The spirit is blamed for earthquakes. When a quake is felt, the locals propiate it deity to strengthen the bonds keeping Daimajin . This is, of course, the practice of the good, local people, who are reasonably happy under their good, local Lord Hanabasa, lord of Castle Yamanaka. Social order comes crashing down when the messenger throws a coup. Evil, as usual, manages to get the upper hand, even though he's clearly an honorless dog. I cannot tell if this is a social critique, since the bad people, especially ones with a deep evil laugh, always seem to have legions of suborinate samurai. This is usually to give the good guys a lot of people to carve through, and also makes Lord Odate's coup look credible. Hanabasa's son and daughter survive, aided by the local priestess's nephew. They are taken to Maijin's mountain, near the god's statue, to live. 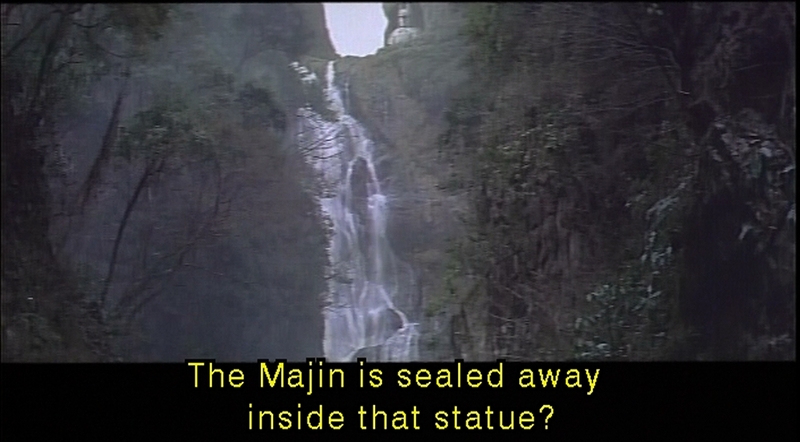 The imprisoning statue of Daimajin stands at the top of a beautiful waterfall. Ten years pass before we pick up the plot again. The children are grown, and Lord Odate is abusing the populace to create massive fortifications around Castle Yamanaka. The building and abuse is reminiscent of the Ten Commandments. This is reinforced when the priestess confronts Lord Odate and tells him to release the people, an echo of Moses' demand that Pharaoh let his people go. The priestess, despite her powerful performance, doesn't come off as well as Moses. Lord Odate, delcaring that he is not superstitious, cuts her down. One of the first scenes in the film involves Lady Hanabasa giving her daughter a hair ornament with some bells on it. 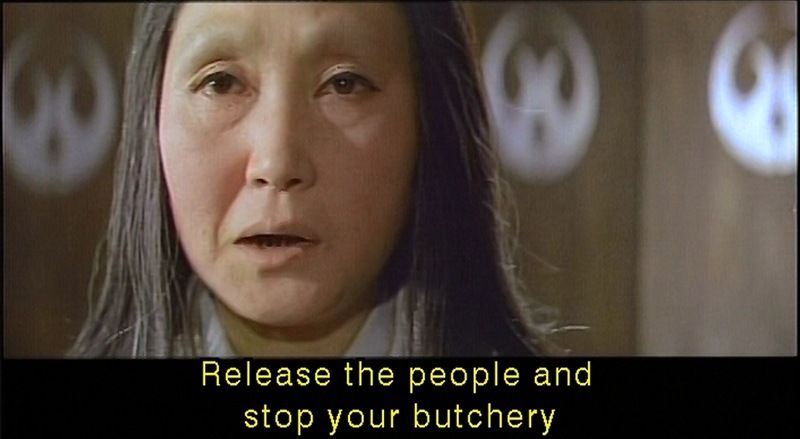 Later in the film, she loses it, one more sign that the wrath of Daimajin will be visited on the evil Lord Odate. And we are, in extremes of despair. All the loyal retainers of the old lord have been captured. The men are crucficied (luckily tied, rather than nailed to their crosses), and the bad guys are breaking the statue. The turning point comes when the servants of the new lord drive a chisel into the statue's head. It begins to bleed. And then very bad things finally start happening to the evil usurpers. After disposing of the men who are trying to destroy the statue, Daimajin once again goes quiescent. Only when a tear from Odate's daughter touches him does Daimajin animate. And then the mayhem begins. In what becomes a characteristic gesture of the film series, Daimajin passes his forearm in front of his face, transforming it from the blank, stone face of the statue to a demonic face with human eyes. The effect is simply achieved, but effective. Once Daimajin transforms, that new face tells us he's we know that he is not screwing around. What separates Daimajin from other movie monsters is his intent. It is a thirty-foot tall stone statue, given movement, essentially invulnerable to anything the humans can throw at it. But Daimajin intends to wreck stuff. Unlike Godzilla, who wrecks cities because he's just passing through, Daimajin is on a quest to kill Lord Odate, and he does so in a deliberate fashion. So his rampage is a bit more calculated that that of other monsters. When he steps on someone, it's because he wants that person dead. The moments when Daimajin changes focus from an old objective, often because that old objective is no longer screaming, to a new one, are effective and chilling. Daimajin's rampage through the newly-fortified Castle Yamanaka is impressive. He wrecks everything. When the defenders try to stop him with chains, he pulls out the beams they're using to anchor those chains. He smashes gates, buildings, burying men under the rubble, then crushing them with his heavy stone feet. Bullets and catapult-driven rocks do not even faze him. When he is blocked by carts full of burning twigs, he summons his magic and snuffs out the flame. Against Daimajin, there is no defence. All the castle's defenses prove futile. Daimajin seems to be be a more adult-oriented film than the Gamera series. Although there is a child character, he is not the protagonist. We see some scenes of torture, and the death of Lord Odate, impaled by the same spike that was driven into the statue's forehead, is explicit, if not gory. What keeps the story from being a simple morality tale is that when Daimajin is done trashing the new castle, it turns on the village in a continuation of its rampage. Daimajin prioritizes the reprehensible over the innocent, but the innocent will suffer as surely as the evil. Only the intervention of Odate's daughter, in the forms of tears, calms him. Daimajin is a good film. The direction is good, the Akira Ifikube music is up to his usual high standard, and this contributes a lot to the film. The plot is a fairly standard revenge film, with justice coming in the end from the supernatural, rather than human agency. The bad guys are bad, with little depth. But the whole makes for an enjoyable and satisfying film. The bad are punished, stuff is wrecked, and the good get to clean up after Daimajin. Next week will not be Return of Daimajin, but an analysis of Pacific Rim. Because I can't wait to see it again.